Digital animators have to attend to a lot of detail. Unlike in live action film CGI detail does not come for free. Digital animators and their creative teams have to plan, model, texture, light and render every object, colour, texture and effect. Because of their limited means, independent animation producers and students inevitably have to take shortcuts. Rather than show a caterpillar climbing out of a matchbox you produce a before and after shot, or just the head with some blurry movement in the background. But with all the resources available to blockbuster animation producers (Pixar, Dreamworks, etc) everything seems to get designed, presented, and rendered to the max — resulting in those elaborate scenes full of acrobatic characters (Madagascar), burning castles (Shrek, Beowulf), and car and motorcycle chases through intricately detailed townscapes (Tintin, Ratatouille). Is the mainstream exempt from graphical economy and restraint? We put this question to the Head of R&D at Dreamworks Lincoln Wallen when he visited Edinburgh recently. The answer was as we predicted. The issues are just the same. Dreamworks characters may have 4,000 manipulable control parameters and thousands of polygons (and nurbs) to be rendered. So the designers and animators always need to cut corners, and to assess whether the detail invested in any scene is worth the effort. In any case, as in live action film there’s an artistic payoff from not showing everything. Leave it to the imagination of the viewer. Add sound to provide further detail that’s off screen, in combination with the language of camera angles, cuts, framing, and the whole mise en scene. I would add that the same applies to static computer renderings. Detail can be implied rather than shown. Years ago my drawing class teacher encouraged us to follow Albrecht Durer in implying detail by just concentrating on a little bit of detail where it counts, eg when drawing a rabbit show the hairs that appear along the profile of the animal; an intricate gnarled wooden surfaces need only show the texture where the light strikes the wood at a particular angle. It seems the eye is accustomed to filling in areas of a surface washed out by light, buried in shadow or obscured by visual noise. Why do we want detail in CGI? It’s not just about realism (or photorealism), but careful manipulation of the attention of the viewer. If the eye is drawn to areas where there’s lots of contrast (the detail), then the artist as illusionist can distract the viewer from the rough bits, draw attention to what’s important, and stage manage the viewer experience. 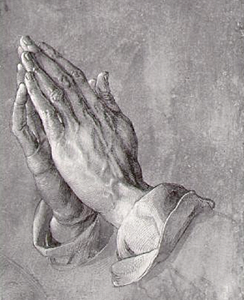 In Albrecht Durer’s famous drawing of praying hands detail is drawn where it counts, including the boundary between light and shadow. 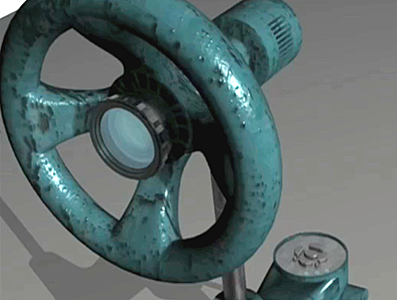 In digital animation some of the detail does come “for free,” thanks to algorithms for rendering “bump maps.” Here the specular reflections or highlights on the computer-rendered metal wheel imply embossing across the whole surface. In any case, the designer has introduced optimal detailing: the concentric rings at the wheel hub, suggesting an illuminated projector lens, and the small panel of buttons on the stand implying an intricate mechanism. There’s an argument here against questing after “realism” in computer rendering. There’s no end to the search for ever more intricate models, larger numbers of polygons, more accurate behaviours (movement, light, water, fire, rustling leaves, hair, fabrics), and more complex interactions (running a hand or paw through a furry mane … as the rain starts to fall). Our perception of the world requires our imaginations, and a substantial amount of projection on the part of audiences. Lincoln suggested as much. Our sensory apparatus is so tuned to human movement and facial expressions that we balk at every imperfection in computer renderings of human movement. There’s a mismatch between what we expect and what we see. But we are less familiar with the way animals move, cars skid, buildings explode and capes billow in the breeze. Here we make allowances — filling in our own detail, and sense of realism. Any correspondence to reality is most likely a correspondence to what we see in film or other animations. In this sense CGI involves a self-referential mediatized looping, an increasingly real feature of our everyday lives. Also see Hygienic reality, Reality restructured, Computer images and realism. The cultural, social and spatial implications of computers and pervasive digital media spark my interest ... enjoy architecture, writing, designing, philosophy, coding and media mashups. 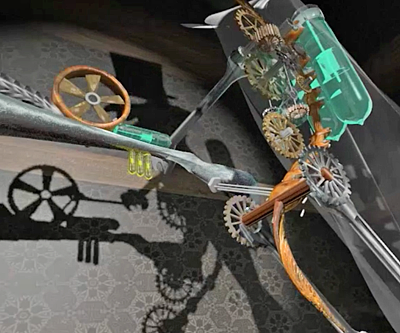 Clark mentioned animation as an “artistic interpretation” of reality. This “interpretation” needs the animators/designers to filter out the less important elements which integrate the observation, research and imagination. I think sometimes the details distract you from the major part you are working on and halt the progress. For production companies like Pixar, they have budget-constraint. While for the students, we have time-constraint. Anyway, you have to resist the seduction from details. Nice insights about detail, as here. Firstly, as Chuck Jones said:” it is about believability, not realism.”, We should try to make animations verisimilar, not realistic. Because they are not realistic things sometimes. We can achieve verisimilitude by making characters and animation logical. 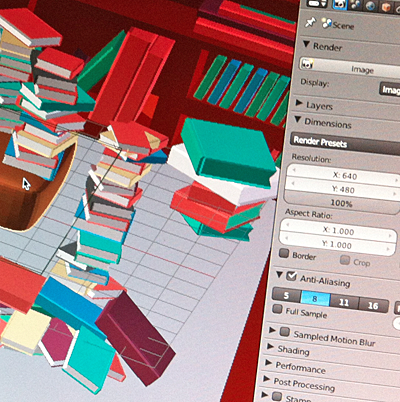 Secondly, how do animators assess the value of details? Before I created my model and animation, I also tried to plan everything about my animation this time. However, I still met many problems and adjusted my plan many times. For example, during the editing and cutting process, some short clips don’t have expected effects, so I have to change the angle of camera or adjust lighting and have to spend time to render it again. Animators of Dreamworks can make an effective plan. Is it because of their rich experience or a scientific and quantitative assessment? I don’t think it’s fair to compare blockbuster animation producers with independent or student animators. While they would both end up doing the same work to get get a result, the blockbuster producer will always be able to finish faster. With multiple features under they’re belt, access to the best technologies, a large team of not just experienced, but also perhaps the best animators in the world providing support, advice and help, they will always finish first. An independent or student can do the exact same work only he will be working at a slower pace with dated technology and no crack support team ready to back them up. Does this mean an independent should cut even more corners just to get done faster? No. But it will be a test of they’re will to stick to it and get the job done when they know a blockbuster could’ve finished in less then half the time it took them to finish.